The custom of weekday mail delivery to one's door is changing now, as Canada Post cuts costs and gradually consolidates delivery to supermailboxes clustered in designated areas near people's homes. It's a controversial decision and will hurt people in rural communities, as well as older people in any community, a lot. As for us - well, we are getting a taste of it at the condo because all the units' mailboxes are clustered inside one of the two main entry doors to the building. And obviously, that is no hardship at all. Usually my mail is boring. Flyers of course, and very occasionally bills, and rather often personalized junk mail because somebody sold our names and this address in the few months since we've lived here. Isn't that the pits? We didn't change our home address - we are still picking up mail there. Apart from the hydro and property tax bills that are specific to this location we just use this address when we order stuff online. Now I have to to get us off all those lists so that whoever lives here after us isn't getting all that junk mail with our names on it. Sometimes, though - once a month, if I'm paying attention - it's yarn. I open up the little silver door to our mail cave and there's a puffy white envelope in there from Julia, with the next installment of her yarn club. 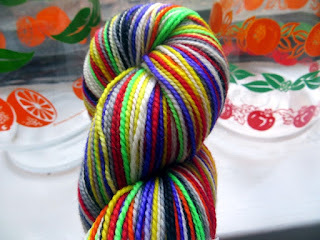 from Knitterly Things, October 2015 yarn club. I don't wait to open that parcel, ever. I start opening it in the elevator, but the ride isn't very long because hey, we're only on the second floor. Also the packaging Julia uses has an emphatic closure, so I'm still opening at I pass the door to the terrace, with its enticing view of flowers clustered along brick walkways. By the time I'm turning the corner to a long hallway lit by windows looking onto the building to the north, I'm drawing a skein of yarn out of the envelope and unwrapping it from its protective tissue paper, the colour of which is different every time. And then, as I make the final turn to our own hallway, I get to admire the colour combination of a new set of stripes. It's always beautiful, in a different way then the last, and I'm always so happy as I turn the key in the (new) lock of our (new) door. I kind of love that long walk with my mail. The flyers we don't need get tossed into the recycling bin at the mail station, right out of my mind. After that, I have the nearly five minutes it takes to get from the mailbox to our door to figure out what the important mail is asking of me and how best to take care of it. 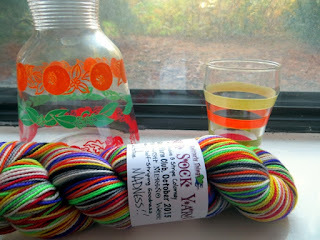 And most importantly, I have time to admire my new yarn before I get home and have to attend to other things. I didn't do that so much, when all I had to do was open the box and step into the house. I suppose I might not do that if I'm walking in heavy rain or through deep snow from a supermailbox to my door, either. But here: it's just nice. Small yarny pleasures, even when there isn't time to knit - aren't they lovely? Hope you get some this week too! ps I do realize this is easily the most boring post I have ever written. I mean seriously, it describes a walk down a hallway not littered with famous sculpture or even occasional spots of of lint or debris (you would not believe how conscientious the staff are in this building - half the time I don't even have to get my keys out for the one untended door because the minute I'm in range of the security camera it opens for me.) Please feel free to use it next time you or a loved one are unable to sleep. Read aloud in soothing tones, it should be an effective replacement for chamomile tea, and possibly sit easier, if like me you can't stand chamomile tea. pps speaking of things you might not be able to stand, I'd like to make a public service announcement regarding the importance of rinsing off all the dish soap from a pan before you start cooking the delicious meal in it that you've looked forward to all day. Sigh.